Trace Balla is often found sketching in nature, riding her bike, dancing, and growing vegies in her garden in central Victoria. She loves to illustrate and write songs and stories, and inspire others in their creativity and care for the planet. Her background is in illustration, community arts, art therapy, animation, and writing songs and stories, and she enjoys visiting schools and festivals to talk about her work. 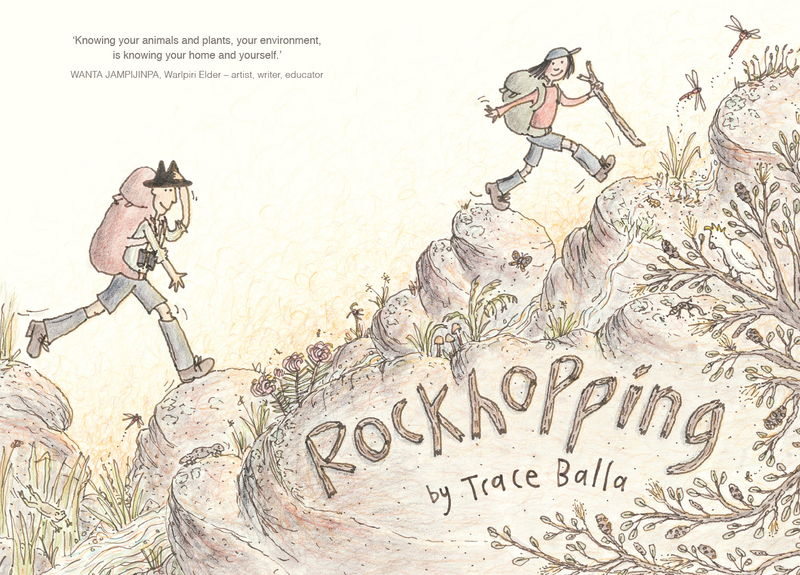 Rockhopping was the winner of the 2017 CBCA Book of the Year Award for Younger Readers, and was short-listed for the 2018 Adelaide Festival Awards for Literature for Children's Literature and for the 2016 Speech Pathology Australia Book of the Year Awards - 8 to 10 Years.Trace's other books, Rivertime, Shine and The Thank You Dish have all been highly acclaimed. Rivertime won the Readings Children's Book Prize and Wilderness Society's Environment Award for Children's Literature, and was shortlisted for the CBCA Awards in two categories, as well as for the NSW Premier's Literary Awards and the Speech Pathology Book of the Year Awards. Rockhopping is a beautiful book to pick up and browse. There are details on every page to catch your interest, starting with the endpapers. The drawings are simple and expressive. Students could practise drawing animals and human figures in this style. Squiggles have also been used effectively to illustrate the landscape and sky. The story is engaging and there is a lot of information shared but the cartoon format means it would be difficult to read this book to a whole class. It is also a long book - 80 pages - so it requires a sustained reading effort. I would like to seek a Picture book edition of this story so I could read it to my early childhood class. Alternatively, does it breach copyright to scan the book and read it on the whiteboard? It would need to be read over a week or so but it could be the basis for a social science/biology unit. I like the way indigenous culture is integrated into this story, with place names and culinary notes included throughout the text. Scientific explanations and Dreamtime are discussed side by side to integrate both into our students’ worlds. Similarly Aussie Rules is seen to have its roots in the historic Koorie game of marngrook. Having read Rivertime by Trace Balla, I wondered if a second book about Clancy and Uncle Egg could be as good. Rockhopping certainly provides the reader with the same engagement and reading pleasure as Rivertime. This is a beautiful Australian text that deserves a place in every Australian classroom and Library. The first person voice of Clancy as he describes his rockhopping adventure with Uncle Egg should engage even reluctant readers. It’s great to have a male persona telling the narrative to entice reluctant male readers in the 9 – 14 age group. The bond between Uncle Egg and Clancy that is established in Rivertime continues in this standalone sequel. Uncle Egg and his nephew Clancy leave the city once again for an adventure in the Australian bush. Heading to the Grampians and the Glenelg River, they experience life under the stars, unexpected weather and get a little lost. The visuals and narrative complement each other in this graphic novel, the attention to detail remarkable. You only need to look at the end pages of this book to see the detail that Balla has embedded in the rest of the text. The best part of this book – it is Australian and the entire text reflects Australiana; nature and the Australian environment. While the target audience for this graphic novel is 9-12 year olds, I would have no hesitancy recommending this to older readers. It is perfect for visual literacy lessons in Year 9 and 10 classrooms especially fitting the Australian Curriculum. It can be used as a related text for the Area of Study; Discovery (NSW Stage 6 English). 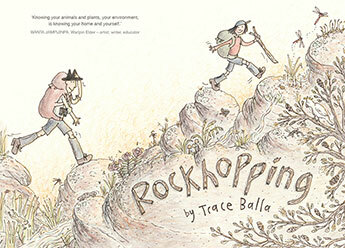 Rockhopping is the delightful sequel to Trace Balla’s award winning Rivertime. Rockhopping tells the story of Clancy and his Uncle Egg and their journey through Gariwerd (the Grampians), which is a series of sandstone mountain ranges located in Victoria, Australia. On this adventure, Clancy and Uncle Egg discover what it means to look for one thing, and find something completely different and to simply just enjoy and exist in the beauty of nature. I will be completely honest, when I first picked up this book to have a glance at it, I was disappointed to see that it had been written and illustrated in a panelled, comic strip layout. This is no fault of Balla’s but merely just a personal preference of my own. So I told myself to give the book a good chance and read a few pages at least. As I began to read and view the illustrations of this book, I quickly noticed the amazing attention to detail Balla has spent on literally every rock, creature, tree and thing. She has obviously spent copious amounts of time to ensure that the beauty of nature is showcased throughout her illustrations and has delightfully encompassed the flora and fauna native to the Gariwerd environment. Before I knew it, I had finished the book and the few pages I had promised myself had turned into two hours of meticulously exploring each and every single page, panel and detail of this book. I am ashamed that I really did judge a book by its cover, or first few pages, when in actual fact this is one of the most beautiful books I have ever encountered. This book perfectly encapsulates Australia’s unique environment and would be perfect in a middle and upper primary classroom. I can see students enjoying the adventurous tone of this book as well as the layout and illustrations. I believe this book will convey to students what it means to live in the beauty of Australia and encourage them to go outside and appreciate the splendour of nature. Uncle Egg and Clancy are spending a lazy, languid afternoon on the Glenelg (Bugara) River which flows through the area we call The Grampians but which is known to its indigenous peoples as Gariwerd. Clancy muses on where all the water is coming from and Uncle Egg suggests that they should find out. But this adventure will be different to the previous one in Rivertime (http://thebottomshelf.edublogs.org/2014/04/11/rivertime/) where they took a canoe to the river’s mouth. This time they will be heading upstream so they will have to walk and rockhop. And this time, Clancy is much more enthusiastic, even prepared to walk to school in new boots every day so he can prepare for the journey. Their journey begins at Budja Budja (Halls Gap), sleeping in a tent under the stars amongst the motorhomes, caravans and pop-tops, already suggesting an underlying theme of being at one with the world rather than manipulating it. And just as in Rivertime, through detailed text and illustration in graphic novel format, we share Clancy’s journey, learning as he learns about the river’s story, its flora and fauna, its secret ways of enabling its ancient custodians to survive, and the prehistoric mountains it passes through. It is an intimate account of his journey, not so much his self-realisation this time as it was in Rivertime but one of resilience, perseverance, self-reliance, respect and trust, particularly when Egg’s backpack falls into a ravine and Clancy is stranded halfway up the cliff. He learns about the power and the gift of silence and solitude and the surprises and secrets Nature is willing to show us if we take the time to look and listen, and about his place in the universe. Even when Egg rejoins him and while they are not lost – “just going a different way”- there are lessons to learn and gradually the relationship becomes one of two equals regardless of age, sharing something unique that teaches them more than they ever imagined. Going with the flow rather than the plan. This really is a story about the journey being as important as the destination. And that message of enjoying the moment we are in is perhaps the most important of all. There is an interview with Trace Balla on the CBCA Reading Time site (http://readingtime.com.au/meet-trace-balla/) which explains the authenticity of the story and how she enables the reader to be embraced by the serenity and beauty just as Egg and Clancy are. In my review of Rivertime I wrote, “It’s not just the story of Clancy and Egg and their journey, but a calming, almost meditative, read for the reader. The format of the comic strip with individual panels not only reflects the pace of the dogged, uphill climb but also ensures the reader slows down to enjoy the surroundings just as Clancy and Egg do. Often when we pick up a picture book we just skim read it just as we can “skim read” our daily lives because we don’t think we have time to delve deeper and really appreciate and value what we have, but as you get into this story it drags you in, just as it did Clancy, until you become absorbed and oblivious to the distractions around you.” And so it is with Rockhopping. It’s a book that deserves every minute you put into reading it but ensure you have lots of minutes so you can savour it to its core. The epitome of Australia: Story Country. Yet another delightful book from Trace Balla, a sequel to Rivertime featuring the further adventures of Clancy and his Uncle Egg. An excellent book to inspire students to go out into the playground and investigate the trees and ground they are standing on. Try to spot birds in their area and make a class list with some research and illustrations. In an age where we are all talking of getting our children off electronic media and out into the world of nature to be closer and involved in the environment this book is just perfect. Clancy initiates a camping expedition with his Uncle to investigate the source of the Glenelg River, an exploration through Gariwerd [The Grampians] up the hills, along the watercourses, sleeping under the stars to finally reach their destination. The journey involves Clancy lumping a huge backpack on his back with all his camping needs, so big he struggles to stand up. He overcomes the huge weight, extremely tired sore legs, being wet, hot and even alone for a whole night. He enjoys a wonderful time investigating every nook and cranny of his environment with a magnifier he has bought along. This gives him an even greater insight into his surroundings. He makes many drawings along the way for his Mum and also learns much from his knowledgeable Uncle Egg. The delightful pictures are full of energy, humour and little asides, my favourite being “Unspotted, Spotted Quoll”. Clancy learns the European and Aboriginal names of many birds, plants, animals, stars, mountains, mosses and lichens. Clancy comes home both physically and emotionally stronger. He decides from now on to walk to and from school with his school mates and his magnifier so he can continue to look more closely at his world. The book is about resilience, experimentation, discovery and engagement with nature and the world around us. The words and pictures all melt into one deliciously amazing story. It makes me want to gather my grandchildren and take them straight out into the bush and breathe the air and take in every bit of our surroundings. Living in the Dandenong Ranges our students could undertake an excursion to research the local forest and surrounds and bring the information back to the class to share and discuss local flora and fauna and its slow disappearance with a view to what we all can do to help reverse the situation.